A 100,000 butterflies and more! I recently saw a T.V. Nature Programme showing an amazing butterfly travel-log in which thousands of butterflies simultaneously left their birth-land to embark upon an incredible feat of migration; stopping off, en mass, for respite in beautiful Hawaii. The programme highlight showed wave upon wave of these butterflies flying, fluttering and cascading about in huge, vibrant swirls; eventually settling like giant clusters of grapes to hang out together in the trees for shared, mutually energizing, warmth. Their orange wing colours combined to blanket the trees; creating a collective of conical formations reminiscent of nature’s rich Autumnal colours and of leaves preparing to leave the trees. The migration of summer into Autumn is all about movement and change – as expressed by the seasonal beauty of “mists and mellow fruitfulness”; of harvesting and shorter days. Each of the 5 ‘Elements’ or ‘Phases’ reflects a season in the yearly cycle. They are dynamic health metaphors for the four levels of existence: physical, emotional, mental, spiritual. Their dynamic interplay is fundamental to Traditional Chinese Medicine Philosophy and states of Wellness. Within TCM’s ‘5 Elements’ framework, late Summer’s transitional, seasonal, qualities correspond to the harmonies of nourishing ‘Earth’ and Autumn’s protective ‘Metal’ Energy. For example, ‘Earth’ (Spleen/Stomach chi) has associations with nourishment, not only of our bodies but also our thoughtfulness i.e. our capacity for applied thinking and studying. Amongst other things, colour comes into the picture too: Earth: yellows & ochre’s. Matal: white, silver, grey. Yellow is also the colour applied to the Solar Plexus Chakra. The Solar Plexus, it seems, is an enticing place for our emotions to sit! In reflexology terms it is aptly referred to as the “stress reservoir”. In our bodies, it’s a location where we can easily experience excited, anxious, nervous, expectant, flutterings, depending on the situation we have to face. In fact, many people say “I feel as if I’ve got butterflies in my stomach” and unconsciously place their hands over this area, as if to protect it, to ‘calm their nerves’. I like to think that such sensations in our solar plexus is the body’s way of communicating with us, linking our thoughts and feelings together to aide performance whatever the context. Of course, sometimes people find it hard to let go of persistent, repetitive thoughts, emotions or behavioural patterns which, over time, manifest as symptoms of diminished health and poor sense of perspective. Breathe in Breath Out … and Release those butterflies! Autumn is a wonderful time of year, whereby the Indian Summer days kindly evolve into frosty mornings and piles of scattering leaves fall from the trees. As with the tress releasing their leaves, the Metal Element (Lung and Large Intestine organ chi) acknowledges the importance of ‘Lung Energy: the breath of life, combined with the self-help mechanism of ‘Letting Go’ (mentally, physically, emotionally, even environmentally!). Sorting the wheat from the chaff! With TCM 5 Elements, this time of year is about assimilating and retaining the best of Metal’s ‘Earth Mother’ gifts (this can relate to experience as well as health, the environment and to nourishing food) and discarding/unblocking what is unnecessary and unhelpful (stress inhibitors) to keep our minds and bodies free; the energy flowing. In tandem, working the meridian network is also about un-blocking, reading your client’s subtle energy imbalances, re-energizing and going with the best directional ‘flow’ for them. Meridians themselves fall under influential spheres of harmonious balance via TCM’s 5 Elements and Yin, Yang theory. They work in a synergistic, mutually inclusive, partnership for positive health and wellbeing maintenance. However, you don’t have to be acquainted with the meridians to find fun and value from The 5 Elements philosophy. Their ‘flavours’ of energy (Water, Wood, Fire, Earth, Metal) within the TCM 5 Element matrix relate to every aspect of life: everything is integrated, interdependent. 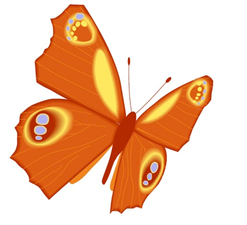 Think of the butterfly’s life cycle. Think of our own life cycle. We are both part of nature’s natural rhythms. (Macro Micro). Less is More! Understanding the diversities of TCM 5 Elements provides a treatment backdrop for fresh thinking regarding subtle energy diagnosis; helping your treatments to become more targeted and effective and – like the butterflies mentioned at the beginning of this piece – mutually energized through togetherness! Re-Tune your treatments to TCM 5 Elements! If you would like to benefit from working with this dynamic and creative genre in your practice, please do contact me. Details about my two workshops are featured in the advertisement below. Fine Tune for Good Vibrations! Working with TCM 5 Elements in Reflexology. Louise Exeter MAR, CNHC, AMT. All images and written material are protected by copyright to Louise Exeter. No work is to be reproduced in any way for commercial purposes. If downloading or forwarding please acknowledge and reference provenance. This function has been disabled for Reflexology Plus London.